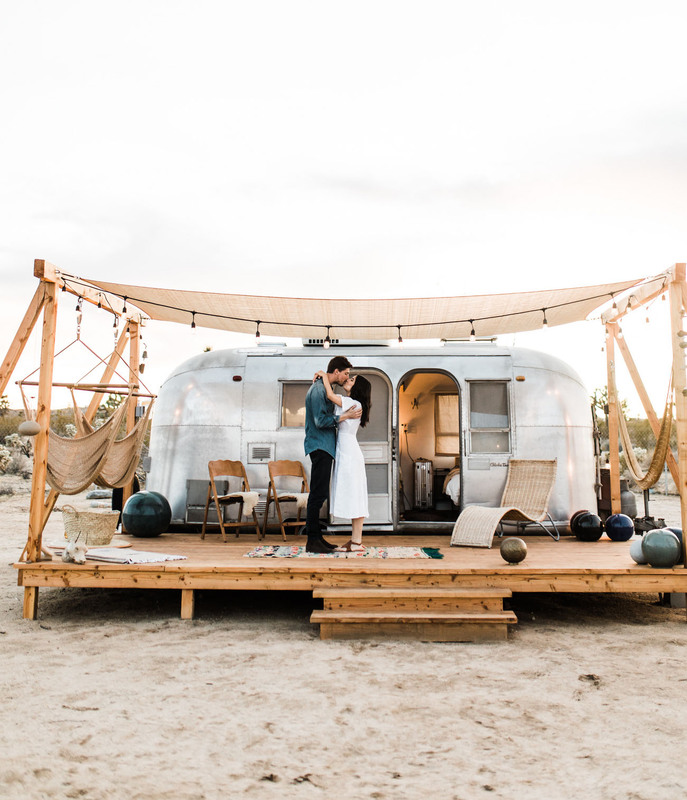 Even though “wedding” may be in our name, that’s not *JUST* what we’re about. 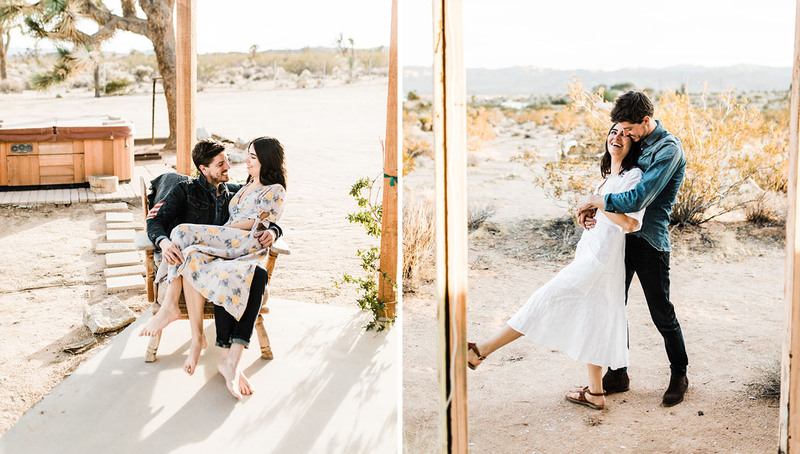 We’re about celebrating love, new and old, about documenting your unique relationship in creative ways to look back on in the years to come, about traveling and finding adventure with your loved one, and so much more… When photographer Clarisse Rae sent over this darling engagement session in Joshua Tree, we were thrilled to find that it captures all of those aspects! 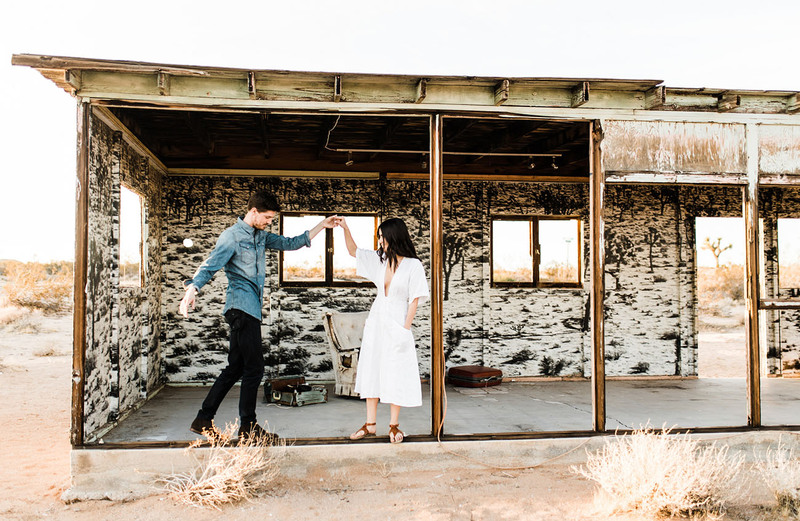 Engaged lovebirds, Natalie + AJ, were going to be visiting Joshua Tree from Milwaukee, Wisconsin, and staying at a seriously rad Airstream camper at Joshua Tree Acres. 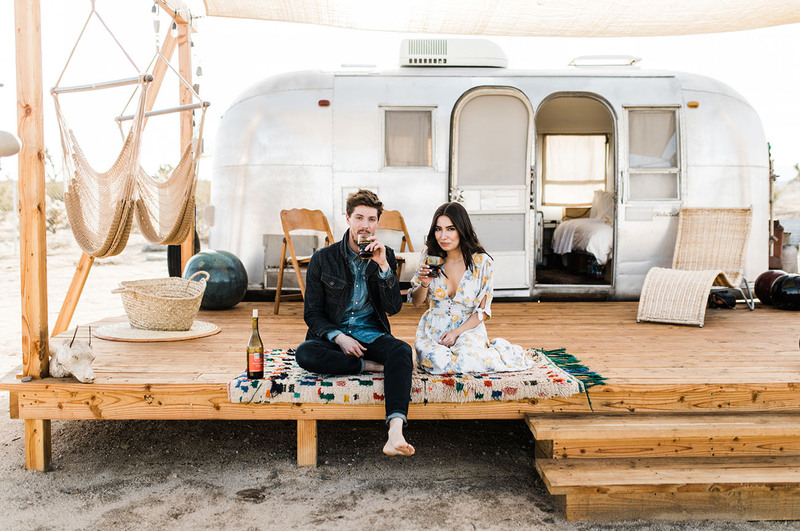 What better place to take photos than in the desert, in a cute “boho bliss” trailer? 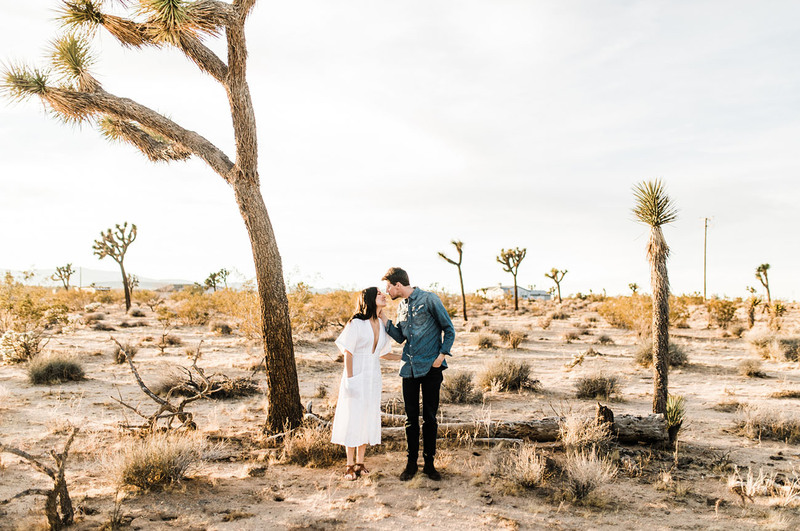 Let’s head out to Joshua Tree, shall we? 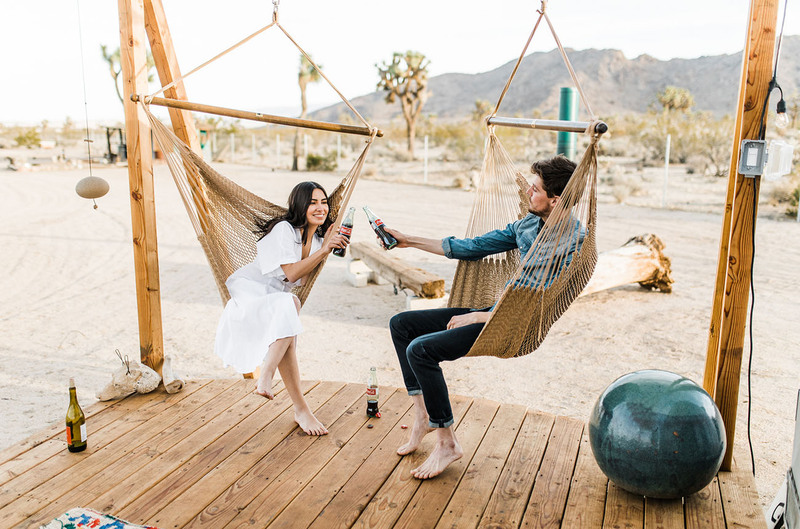 N+A are slightly obsessed with Mexican Coca-Cola (have you tried it? ), so they brought a few bottles to sip on! 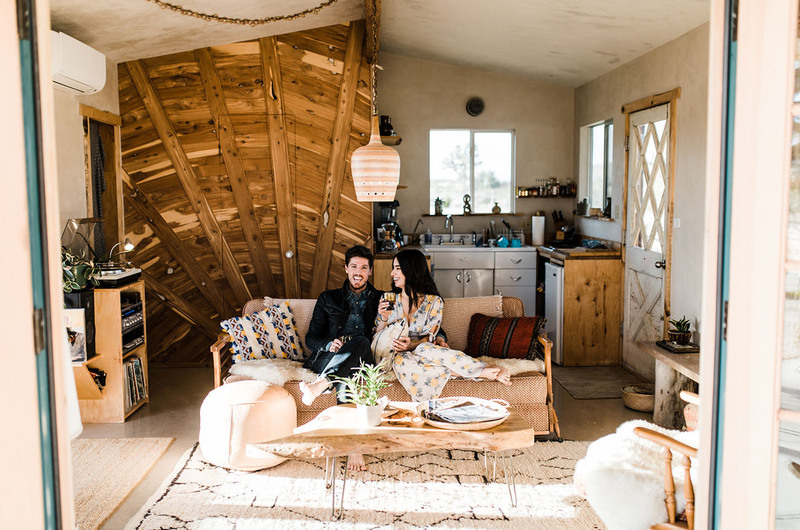 We LOVE when couples incorporate these uniquely them details — it’s photos, their wedding, and their home. We totally dig their outfits, too! Definitely something you’d see us wearing… Natalie’s white dress is by a fave of ours: Reformation. Our story “begins” in Boston by way of Chicago. We met at mutual friend’s birthday in Chicago — we talked all night and he finally asked for my email address (don’t worry, I eventually gave him my number, too.) At the time, I was living in Chicago and A.J. was from Milwaukee, but traveled frequently for work. The logistics of a “first date” proved difficult: A.J. was off to New York, and Boston for two weeks. He offered to fly me out to Boston, take me to dinner, and show me around the city. I would normally would never do this, but I had multiple friends telling me he was an amazing guy…Boston became the the first of many “yes-es” in our relationship! We traveled the world together for the next year and a half – from Disneyland to Vienna, New York to Prague, Montreal to Budapest. We did it all. We kept dancing around a trip to Asia, a side of the world A.J. had experienced many times prior, but was still foreign to me. On our trip, we went from Hanoi to Ho Chi Minh City (Saigon). I really wanted to stay in a bungalow extended over the water in Hue, a sleepy coastal town on the eastern shores of Vietnam’s Gulf of Tonkin. It was supposed to be our quiet retreat; a contrast from the “hustle and bustle” of Hanoi, and Saigon. Little did I know that A.J. had bought a ring months prior, and was waiting for the right proposal opportunity. 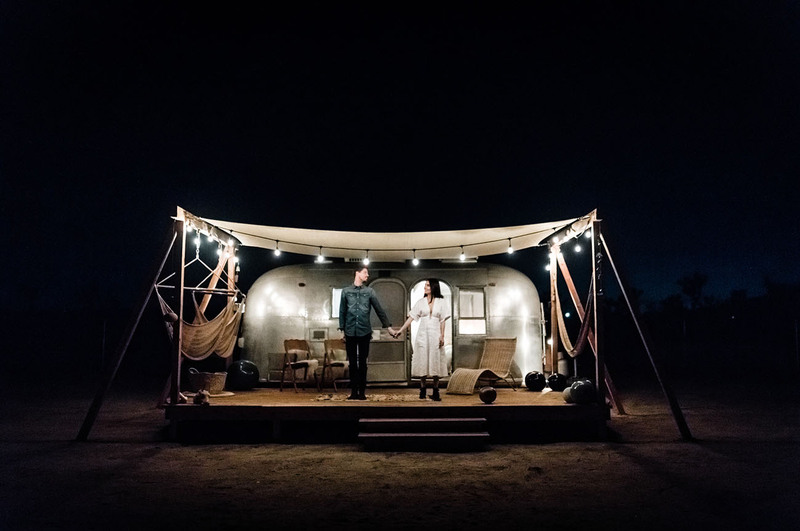 Our private dinner, filled with 4-courses, bubbly, tea lit candles, and fresh flower petals throughout the bungalow, was offset by the burning glow of an April Vietnamese sunset. Somewhere between plate one and two, A.J. suggested we play some jazz music; by plate three we transitioned to Reggae; and before dessert we stood up to slow dance. The song ended, he stopped, told me he loved me, and wanted to spend the rest of his life with me. 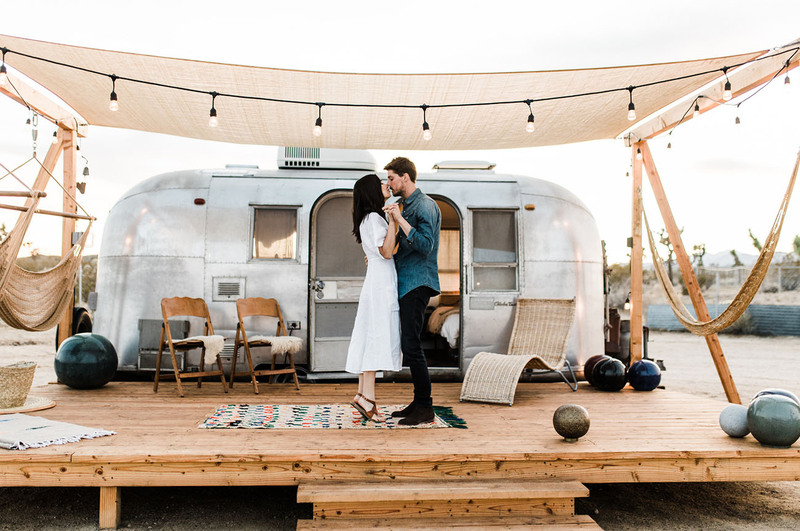 How we adore a good proposal story!! And quick outfit change into a darling floral Free People dress! The caravan ! Love it ! Stunning photos! 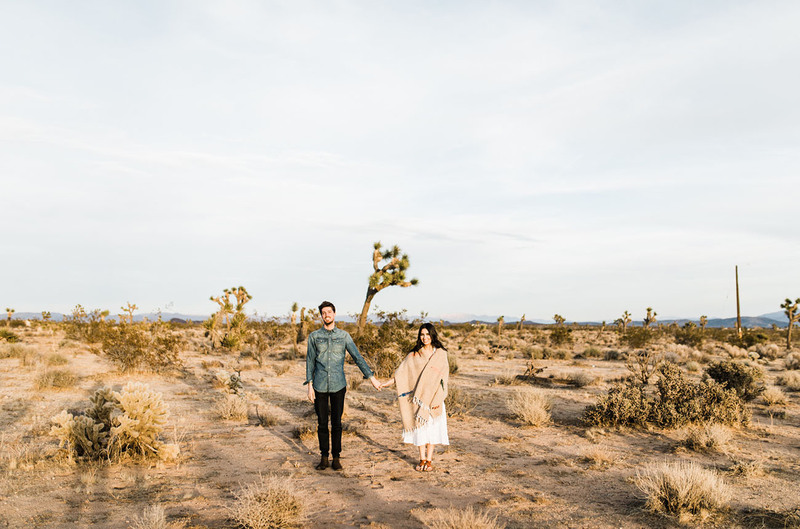 Incorporating something personal to the couple in the photos is a great idea! A amazing inspiration! 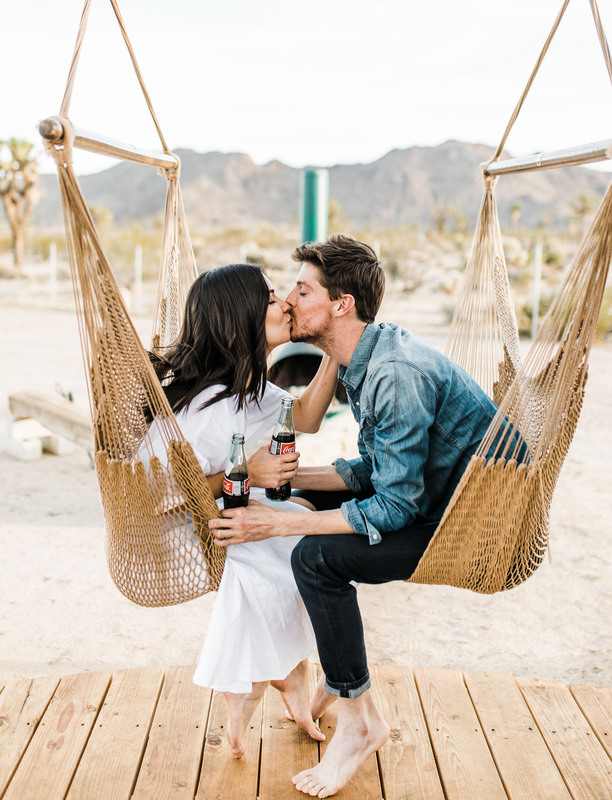 What a beautiful engagement story! And the photos look gorgeous! 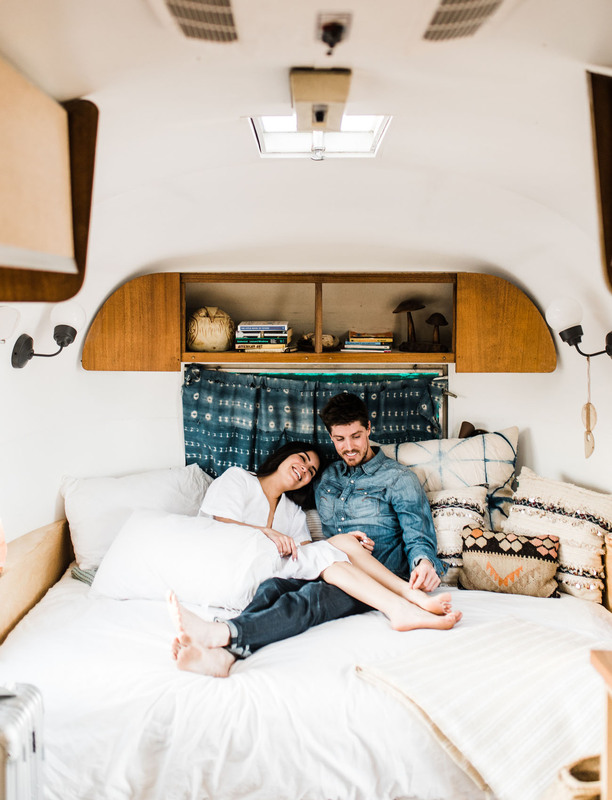 Wonderful photos and style, well done!